Hillary Clinton holds a 12-point lead over Bernie Sanders among likely Democratic primary voters in New York, a new poll shows. 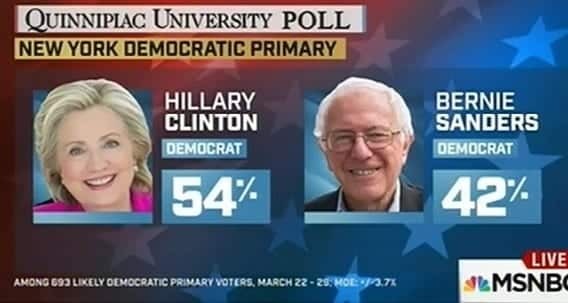 The poll, released Thursday by Quinnipiac University, shows Clinton generating 54% of support from Democrats, with Sanders at 42% — and Clinton holding a 29-point advantage among moderate voters. Donald Trump leads for the Republicans with 56%, followed by challengers Ted Cruz (20%) and John Kasich (19%). This entry was posted on March 31st 2016 at 9:41am/09:41 and is filed under Elections, Live News Column 2, Politics, Polls. You can follow any responses to this entry through the RSS 2.0 feed.